(Sam Cunningham/City of Waukegan via AP) This Monday, Oct. 8, 2018, photo provided by the City of Waukegan, Ill., shows a 4-foot alligator in a van outside city hall after animal control workers helped capture it from Lake Michigan. The alligator, whose mouth was taped shut, was spotted by a kayaker fishing for salmon off the Waukegan shore. It was taken to the Wildlife Discovery Center in nearby Lake Forest. Animal control officers have started an investigation to determine who dumped the alligator into the water. Waukegan, Ill. • Authorities don’t know who dumped a four-foot-long reptile in Lake Michigan, but they now know what kind it is. 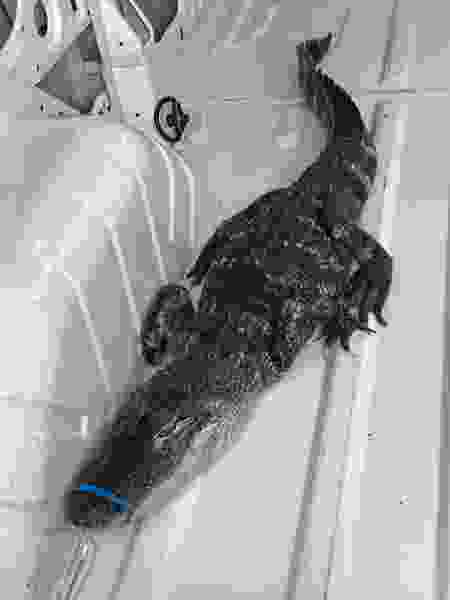 Either way, it had no business paddling around the suburban Chicago shoreline and Waukegan spokesman David Motley said Tuesday that animal control officers are trying to determine who abandoned the alligator, which was found with its mouth taped shut. Motley said officials thought the animal was a caiman for much of Monday, but the head of the Wildlife Discovery Center in nearby Lake Forest later told him it was an alligator. Motley said the gator likely would have died within a few weeks if it hadn’t been rescued and brought to an animal control officer. He said there was a similar incident in 2012 in which someone abandoned a 14-foot python on the lakefront.